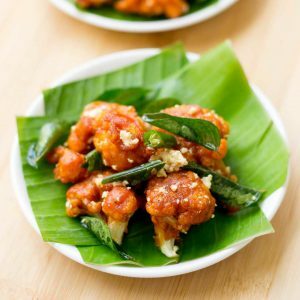 Recipe for Mangalore style Gobi Kempu. Deep fried cauliflower sauteed and finished in an yogurt sauce. Recipe with step by step pictures. One of my favorite recipes on the site is Chicken Bezule. This is the veg version of the same recipe. This gobi kempu is a crowd winner. 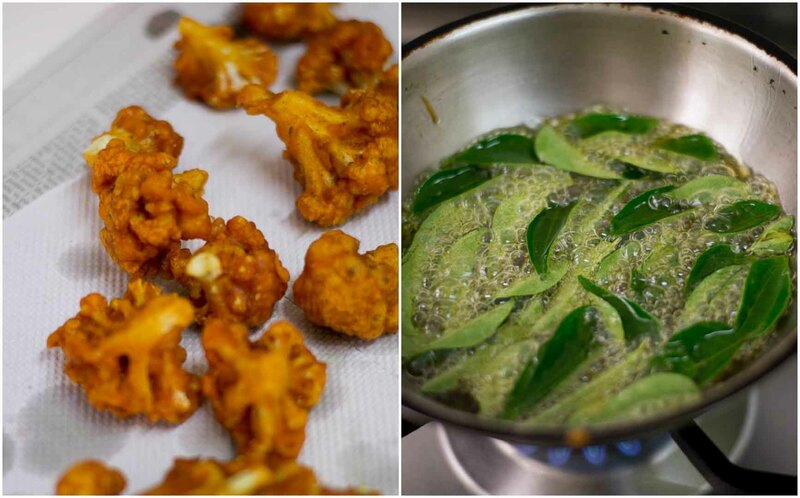 Deep fried cauliflower is sauteed and tossed in a spicy yogurt sauce. This mangalorean inspired recipe is a very nice appetizer. Do try at home. Lets prep the cauliflower. Break the florets into bite size pieces. 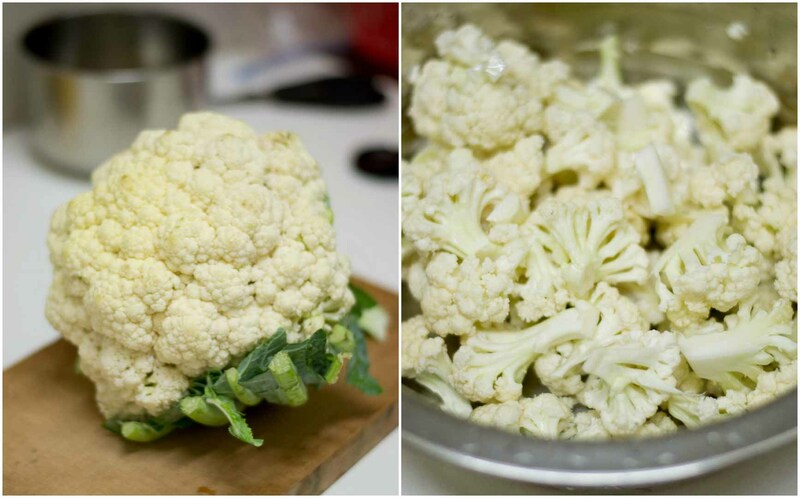 Cut the Cauliflower into florets and add it to a pan filled with water. Add a little turmeric and salt. Bring it to a boil. 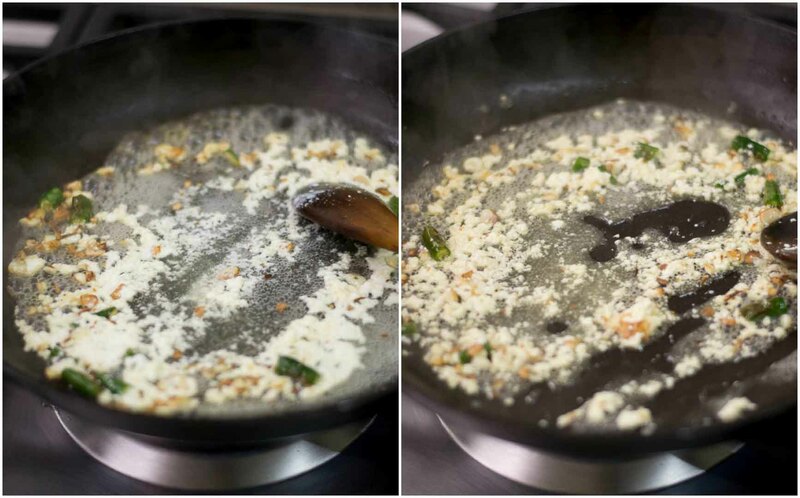 Once the water in the pan comes to a boil, switch off the flame and let it rest for 20 minutes. Drain the water. Set aside. This process gets rid of all impurities, dirt and minute worms that might be present. Take a big bowl and add in the corn flour, maida (all purpose flour), rice flour and salt. I do not use any color for the recipe. 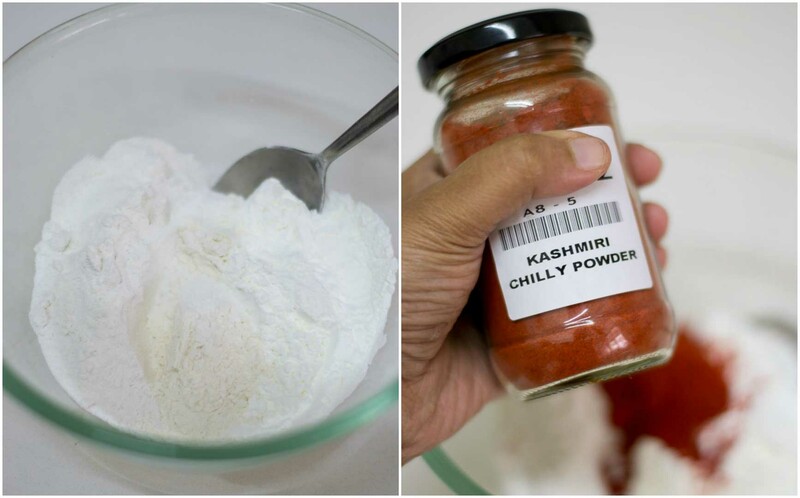 Using Kashmiri chilli powder will give the natural red colour for the dish. Add in the red chilli powder, turmeric powder, garam masala powder and black pepper powder. Add in the ginger garlic paste. Add in the water and mix well. Note: If you eat eggs, add an egg to the batter. Its optional but the masalas coat very well to the gobi when eggs are used. Add in the water and mix well to make a paste. Add in the cauliflower florets and mix well to coat.Set aside. Heat oil in a pan/kadai in high flame. High flame works well for frying Cauliflower. 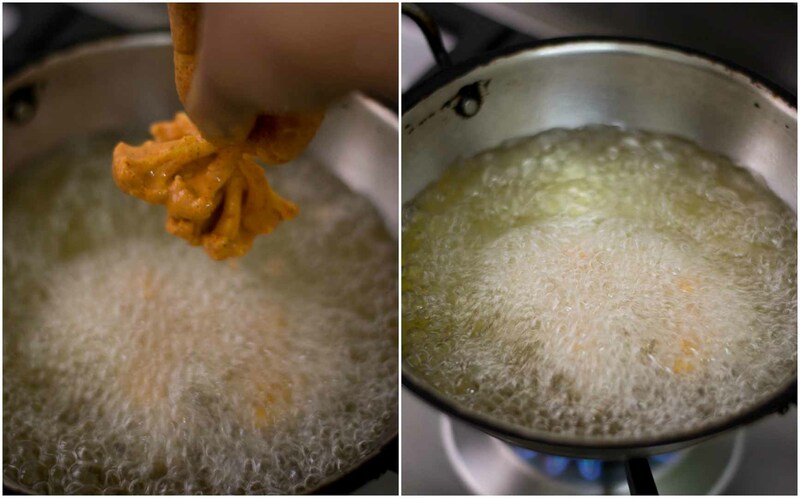 When the oil is hot, drop in the Cauliflower florets one by one. Do not over crowd. Do not disturb the oil with the spatula for the first 2 minutes. Leaving it as such helps in the batter to nicely coat the florets. 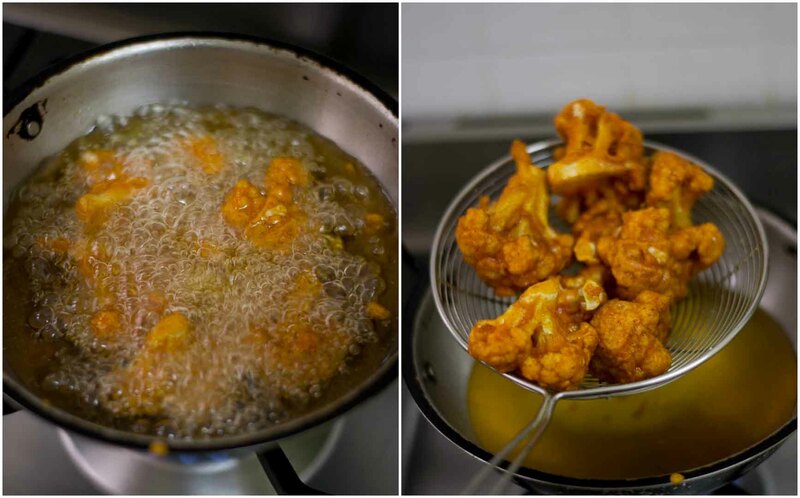 When the Cauliflower is cooked (the bubbles have subsided), remove from oil. Drain on a paper napkin. Set aside. Repeat with the rest of the Cauliflower. In the same oil fry a couple of sprigs of curry leaves. Drain the fried curry leaves on a paper napkin. Set aside. 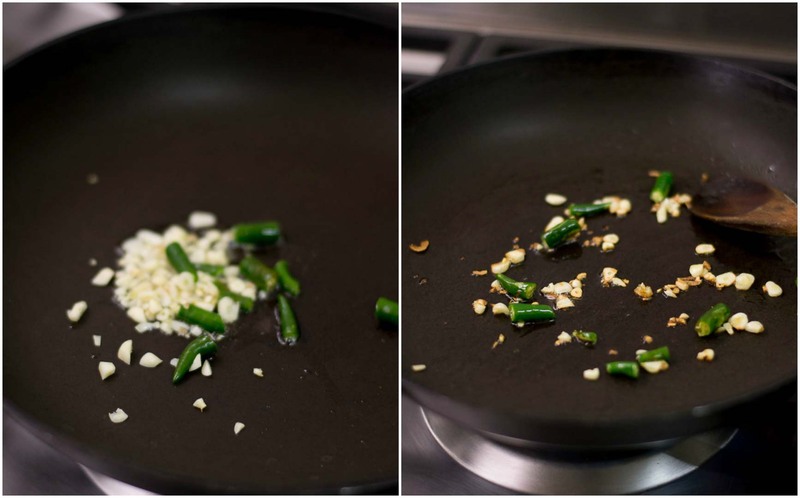 Take 2 teaspoon of oil in a pan. I used the same oil used for frying cauliflower. Add chopped green chillies and chopped garlic. 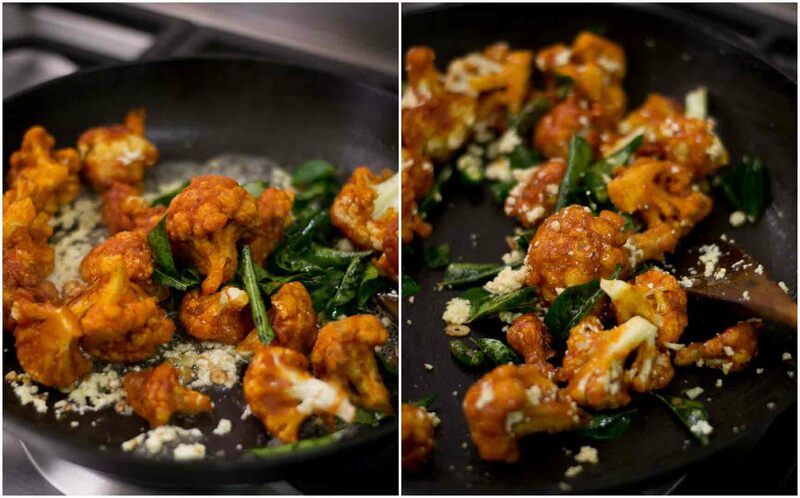 Add more chillies if you want a spicy gobi bezule. Add in the yogurt and saute for a minute. The yogurt will curdle and that’s what we want. 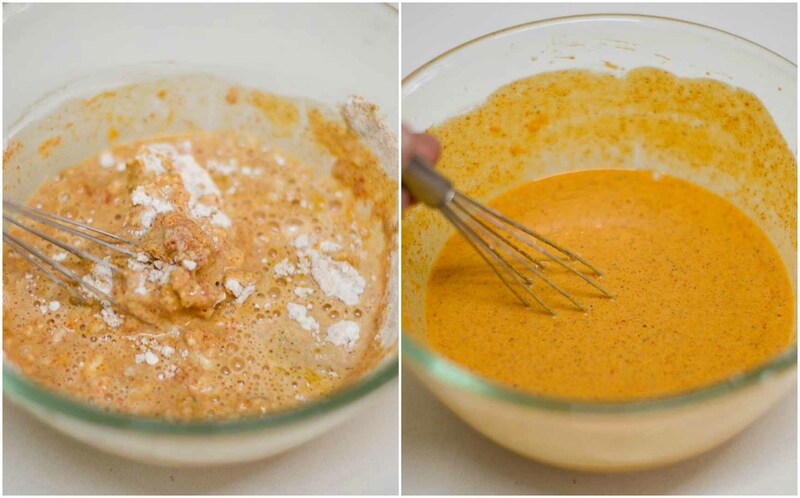 Add in the fried gobi pieces to the curdled yogurt sauce and briefly toss to coat. Add in the fried curry leaves too! 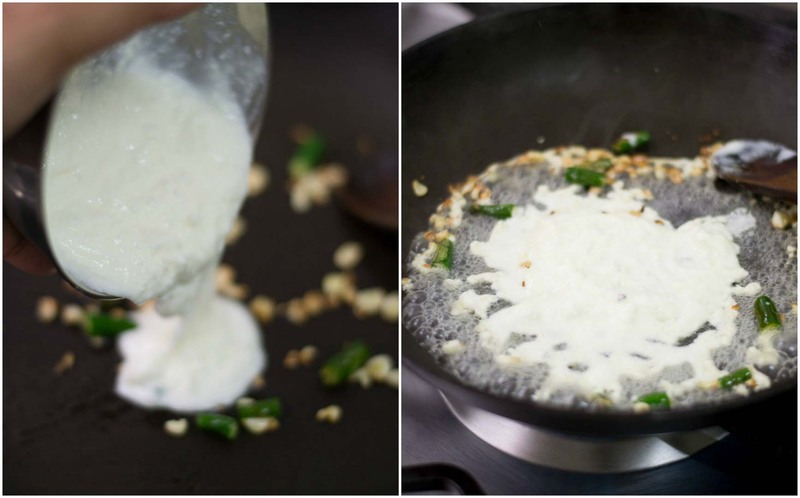 Remove off heat and serve gobi bezule hot immediately! 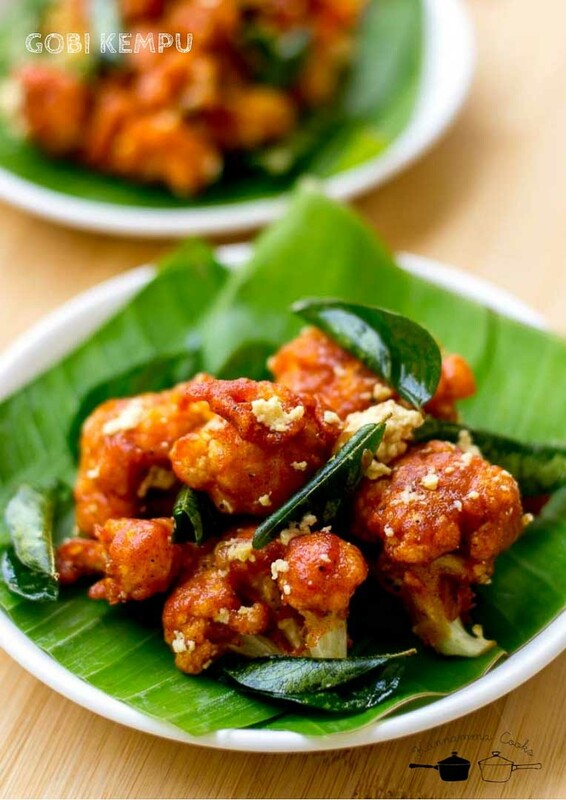 Recipe for Mangalore style Gobi Kempu. Deep fried cauliflower finished in an yogurt sauce. Recipe with step by step pictures. Add in the red chilli powder, turmeric powder, garam masala powder and black pepper powder. Add in the ginger garlic paste. Add in the water and mix well. 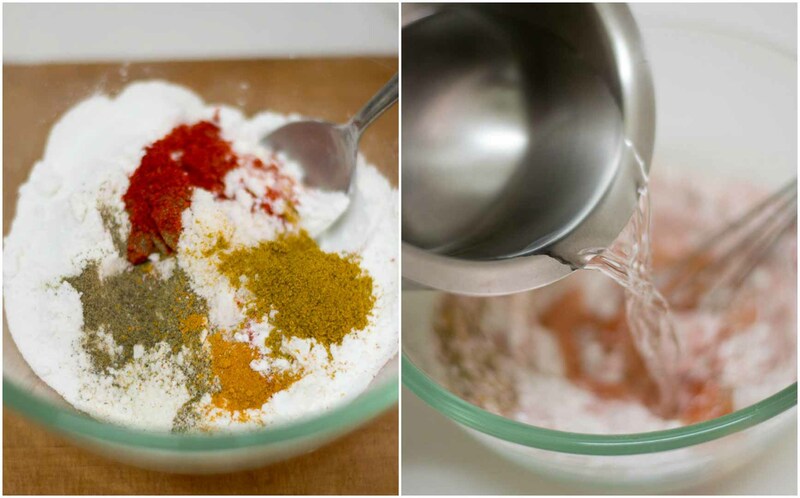 Mix well to make a paste. Drain on a paper napkin. Set aside. 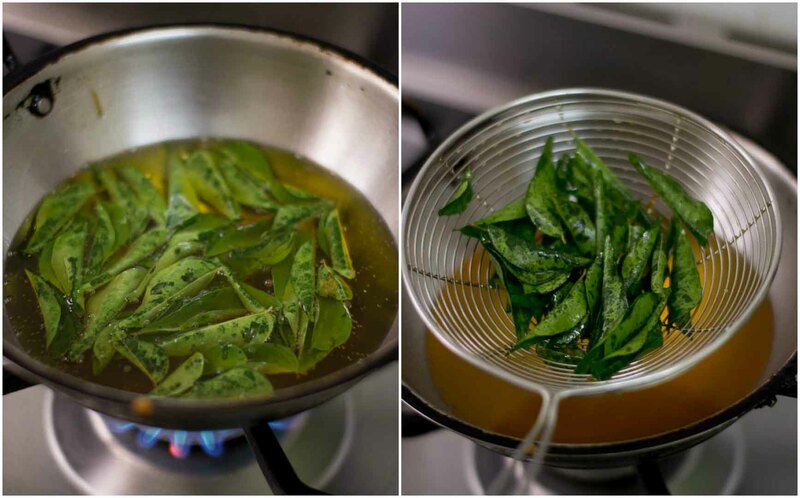 In the same oil fry a couple of sprigs of curry leaves. Drain the fried curry leaves on a paper napkin. Set aside. Take 2 teaspoon of oil in a pan. I used the same oil used for frying cauliflower. Add chopped green chillies and chopped garlic. 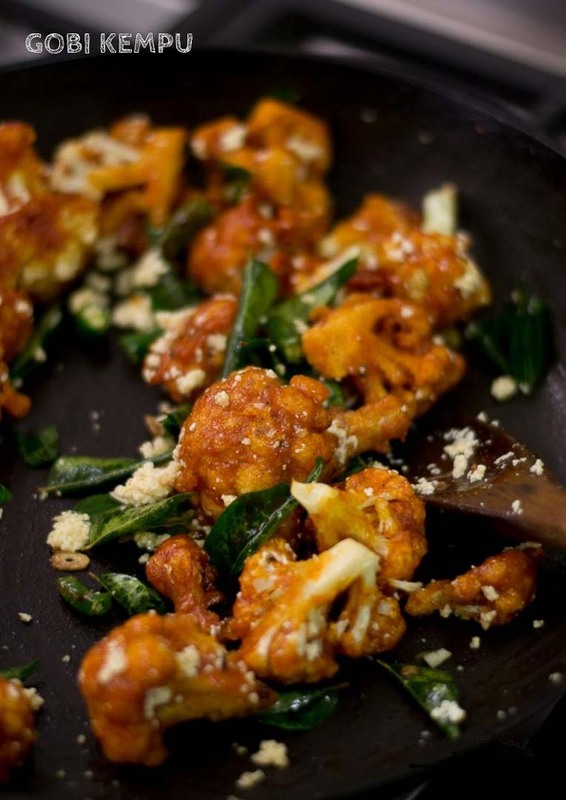 Add more chillies if you want a spicy gobi bezule. Add in the yogurt and saute for a minute. The yogurt will curdle and that’s what we want. 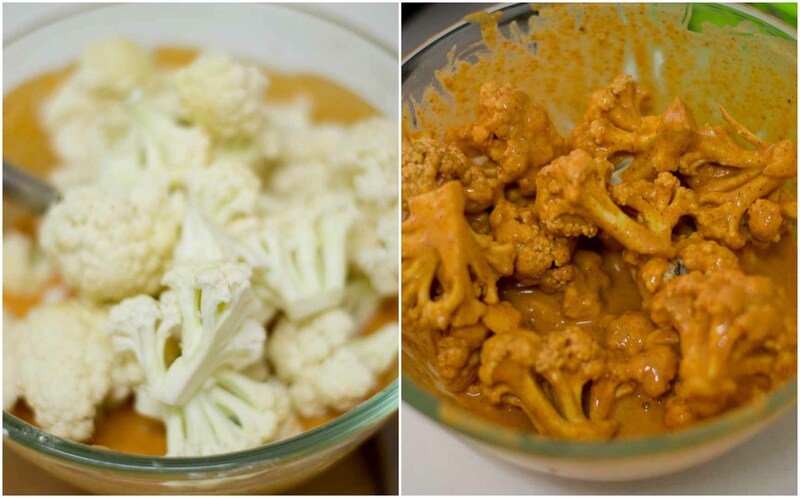 Add in the fried gobi pieces to the curdled yogurt sauce and briefly toss to coat. Add in the fried curry leaves too! 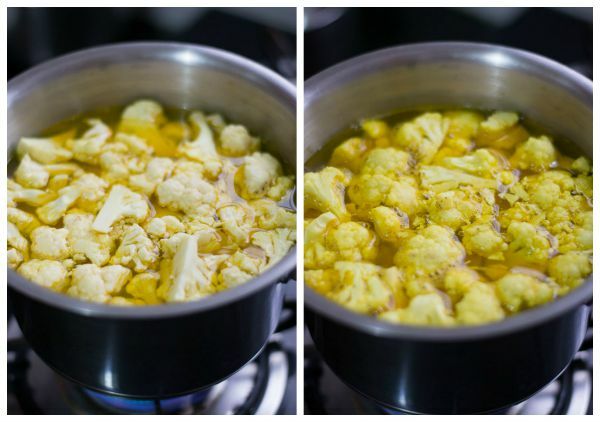 Remove off heat and serve gobi bezule hot immediately! looks appetizing and mouth watering.I will make this and thanks for the recipe.